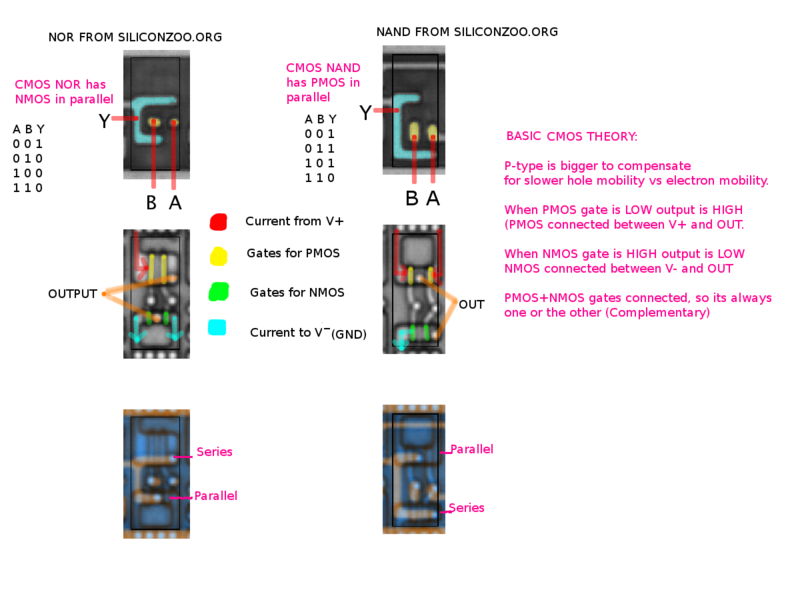 While some basics are outlined here, you should understand basic MOSFETs before attempting to understand CMOS. While that page focuses on discrete transistors, this page focuses on how they are integrated together to form logic elements. This page focuses on random logic. See other pages for more specialized topics like SRAM arrays and analog components like capacitors, Schmitt triggers, etc. This allows constructing the above inverter. When low voltage (ground / 0) is applied, the top MOSFET (PFET) switches V+ (1) out. Conversely, when high voltage (V+ / 1) is applied, the bottom MOSFET (NFET) switches the output to ground. Since 0 in outputs a 1 and a 1 in outputs a 0 this circuit is known as an inverter. This example describes how a simple inverter (from RSA SecurID 1C) is physically constructed. Modern ICs are much more complex to increase performance but follow the same basic principles. Although simple, this is everything necessary to translate more complex circuits like FF's into discrete schematics ⇒ higher level logic. Here's the active area from an inverter. For now concentrate on the two larger rectangles and ignore the two smaller rectangles. As alluded to earlier, our first puzzle is to determine which of these rectangles is the PFET and which is the NFET. PMOS tends to be slower than NMOS and uses larger transistors to match NMOS speed. Therefore, the right side is P doped and thus the left is N doped. The wells on the side don't contribute to logic and therefore can generally be ignored. For the curious, they are “guard bars” to help prevent latchup. Essentially this helps bias the transistor to prevent parasitic bipolar transistors from switching on and subsequently shorting out the die. The two tick marks in the middle are etch marks and not part of the layout. Each side forms a basic FET: poly gates allow changing substrate charge to turn transistors on/off. Both transistor gates are tied together just like in the earlier inverter schematic. Although adding poly formed a functional transistor it wasn't wired up to the reset of the world. Poly has relatively high resistance and so is best used only short distances. Also note the small vias (circles / squares) between the metal and poly and active areas. These connect metal layers to poly and active layers.